As many of our readers already know, this fall has marked the 250th anniversary since the protests against the Stamp Act, one of the earliest major actions of the imperial crisis that resulted in the American Revolution. Over the course of a year—from the first arrival of the Act in May 1765 until news of its repeal arrived in May 1766—colonists in the “thirteen original” colonies (as well as the “other thirteen”) passed resolutions, argued in essays, marched in the streets, forced resignations, and otherwise made clear their displeasure with paying a tax on their printed goods. By a fortuitous coincidence, I was offering an upper-level course on the American Revolution this semester. I try to keep an eye out for enticing ways to offer audiences for student research that invite more thought than the standard one-reader (i.e., me) essay. Inspired by a number of similar projects, most importantly @AbesLastRide run by fellow Junto-ist Ken Owen last spring (about which he wrote for The Junto), I designed a research project for the course that would result in a feed that live-tweeted the events as they happened 250 years ago. Since late September, my students have had 20-30 tweets per week posted to our Twitter feed, @KillingStamp. The goal for students was twofold: first, require them to do all of the same work they would for any other research paper (including, yes, providing well formatted Chicago-style citations in a separate document), and then ask them to think about how to convey that same information, with an embedded argument, in a set of 140-character tweets visible to the public. Because many of my students have rarely used Twitter, I worked with history communications expert Liz Covart to create a practical guide to using the service, and provided ample (at least I thought so) class time for students to work on the project. You can click over to @KillingStamp yourself and take a look at the results. Last week, as the semester was coming to a close, students wrote reflections on their work on the project. Because it has been so experimental, it’s important that you hear from them. To that end, I invited four students from the course to present their thoughts on the project. When the Twitter project was first proposed, I had my reservations, to say the least. I didn’t believe that history should be presented through social media as it would not be an effective way to understand past events. I was wrong. Tweets seemed to be an excellent way to present history and it was also more effective in putting the scope of the event into context. First things first, we had to figure out how to construct our tweets. As we were representing what people thought at the time, we thought that it would best to speak as though someone from the past had access to Twitter. It’s more interesting than just saying “On this day this thing happened and this person said this thing.” As history majors, we don’t get to speak in the present tense so we have to take the opportunity whenever it arises. We tried our best to make it as close to 1765 language as possible, however we’re still a bunch of undergraduates so sometimes that did not work out as well as we’d hoped. Also, it’s hard to keep the same tone as it’s a large group of people who each has their own different idea of how the tweets should be constructed. One problem with creating this Twitter account is who was going to be following and reading our work. Many historians ended up following us but we still weren’t sure who would be following us. However, it would be possible to create a Twitter similar to this but more for the general public. There are plenty of people out there who are interested in history but don’t devote their lives to it. So a Twitter that just says interesting historical facts could be of interest to many people. Creating the tweets was not as difficult as I’d worried it would be. While it’s only one hundred and forty characters, it was plenty to convey the feeling of the protests of the Stamp Act. As we were only speaking of one event per tweet it wasn’t as terrible as it could be. Context was given by the title of our twitter feed, “Killing Stamp,” it’s clear that none of the tweets were going to be in favor of the Stamp Act. That being said, we did make note of the opposite side but usually with a snarky remark about how horrible those opinions are. It’s not so different from expressing politic sentiments in the present day. By writing tweets day by day we were able to see how the protests would have progressed. When writing a paper, it’s easy to get engulfed in the macro events and broader political ideals that drove the protests. Instead by writing tweets day by day, we’re forced to confront the little details. We got to see what people were saying in the newspapers on a consistent basis as oppose to just pulling a couple quotes out of some random source to support our paper. It’s almost like a timeline in how we can see what exactly happened. When the Stamp Act is over, that is when the Twitter feed ends but that doesn’t have to be the case. After the Stamp Act there are plenty of events of the Revolution. I believe that as a result of this project, our class has gained a healthy respect for mixing social media and perhaps some of us will do this again. History is really just a succession of events all of which can be live tweeted, after all. As one who follows my professor (@jmadelman), one of the William Shakespeares (@Shakespeare), and Chaucer Doth Tweet (@LeVostreGC), as well as several classmates, my presence on Twitter is rather limited. That said, Twitter lets an undergrad feel connected to the academic community in a way that engaging with articles from JSTOR does not. This project in particular gave us the opportunity to research, write, and publish our collective interpretation of a period of the Stamp Act Crisis, and have what we created judged by the Early America Twitter community. as well as some old news from Virginia that had just made its way to Pennsylvania. We did have some interesting responses to the project. There was one follower who decided that she could use our tweets as a foil for modern political commentary. Considering that none of us has exactly the same politics, Dr. Adelman advised that we leave such tweets alone so as to not get embroiled in a fight one way or the other. J.L. Bell, on the other hand, engaged with the project in a very historiographic way. It was very cool to be able to engage with the author of Boston1775, especially about whether or not to trust John Adams about what people actually said. Honestly, the best part about the project was that other people followed us. We have a class of 20 +/- but 166 people, as of now, follow @KillingStamp. That means that 146 Twitter users interact with our tweets and have often engaged in conversation with or about them when they did not need to. The majority of our tweets have been retweeted at least once, which greatly expands our reach beyond just those 146 or so followers. Several of them are high school teachers or professors, which means that it is quite possible our tweets actually made it into other classrooms. There is so much content created by students that never actually leaves the classroom, but this project is different. We’ve created something that actually moved outside the classroom, and became something more than just a class project. 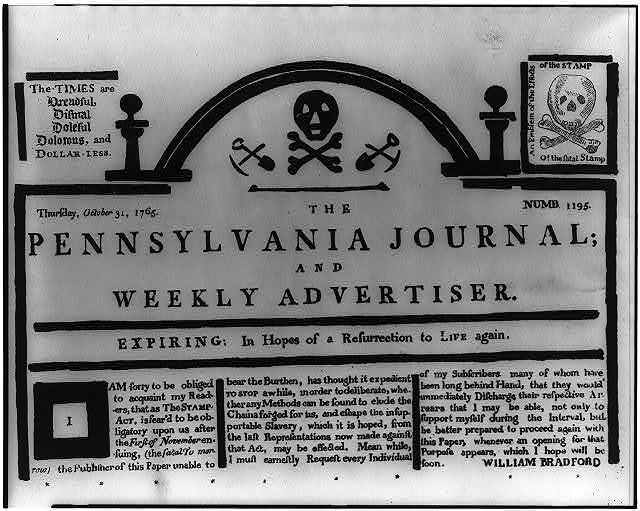 The “tombstone edition” of the Pennsylvania Journal, October 31, 1765. When attempting to get students more involved in a unit or lesson you are studying, it can sometimes be hard to find activities that will fully engage them as well as ensure they are actively learning. However, every now and then you design a project like this Stamp Act Twitter project that students take away almost everything you wanted them to. This project allows each student to enhance his/her research skills by working with multiple databases in order to find the primary sources they feel are relevant enough to include in their tweets. However, this part of the project is not so easy to do. While there are countless databases, there is no way to ensure that something took place or was recorded on each day that the group is covering. They may not always be successful in their search, but in doing this students are able to develop and master their research skills. Our group was tasked with focusing on the week leading up to the day the Stamp Act would be enforced throughout the colonies. This week was extremely interesting to look at because there were so many newspaper articles that expressed the colonists’ opposition to the passage of this act. While we have learned in school for years how much they despised this law, it was really intriguing to see what they actually had to say about it. Similarly, we also found several articles reporting stamp officers who resigned from office or were hanged for their dedication to their job. These were the articles that our group found most interesting because the articles written about these events were generally in a supportive tone. However, many of the same articles were printed in several different newspapers on different days which made it difficult to determine which ones we had already mentioned or find reports we had not seen yet. Perhaps one of the hardest, but also most engaging, parts of the entire project was attempting to write our tweets. At first we did not know how to approach this; we were not sure if we wanted to write the tweets in slang from today (which we decided against), but it was also hard to report these events as if they were happening presently. Once we determined the tone and language we would use when drafting our tweets, it was fascinating to think about how the colonists would’ve tweeted about these incidents if they had the chance. I think, as a group, our favorite tweets to compose were for October 31st and November 1st; the day before and day of the effect of the Stamp Act. These were also the tweets that got the most acknowledgement from our followers from our week. This part was perhaps the one students will take away with them the most because it allowed them to develop historical sympathy for the colonists during this time. As expected, this first attempt of the project has some kinks in it; however, it is an activity that fully engages students and allows them to develop skills necessary for any history class. Therefore, I am excited to see an improved version of this project implemented again. Twitter as a medium of conveying historical information seemed odd to me at first. Usually when I think of Twitter I think about everyone’s favorite celebrity posting mindless chatter. Certainly there was no one within this realm of social media that shared the appreciation of my classmates and myself for historical knowledge. To my pleasant surprise I was very much mistaken, Twitter had more to offer me than just the happenings of the entertainment world. Within this massive social world were many people that did in fact share my appreciation of history, some had even taken on the personalities of major historical figures such as Alexander Hamilton. When I began the process of researching for this project, a commemoration of the Stamp Act and the call to action that it created amongst the colonists, I was excited at the prospect of creating a narrative of the events of this time period. Most of the information that I used was found in databases for early American newspapers and imprints, I also used the Annotated Newspapers of Harbottle Dorr. Even though I did not have them in person, reading from newspapers and pamphlets that were written over a century ago was extremely rewarding and engaging. Dorr’s annotated newspapers proved to be the most interesting; they gave you a chance to see into the mind of the average man that had to deal with the effects of the Stamp Act and the trouble it brought to the colonies. One aspect of this commemoration that proved to be a minor hindrance was that Twitter only allows each tweet to be 140 characters long. Historians by nature are used to being able to write extensively in order to convey historical context and explain their standpoint. In using Twitter and naming the account accordingly you provide some historical context. Also the type of person that is going to follow a Stamp Act account is going to know at least a basic amount of information about the Stamp Act itself. The reason I remembered this quote was that it seemed to be a call to action for all the colonists, the words of the few meant to mobilize the many. We were able to commemorate an immensely important moment in colonial history and immortalize it on the internet for all to see, that to me made any struggles that we may have found in this project completely worth it.